With his mother’s blessing, a 15-year old Danny moved from his native Kauai to the North Shore of Oahu— “the summit of the proving ground”—to make his mark on the massive barrels of the world-renowned Banzai Pipeline. “I fell in love with the place and wanted to become one of the standouts there,” he says. By 16 he did just that (“I started getting ahold of some waves that were separating me from some of my peers,” he says), going on to become one of the faces to watch on the big-wave competition circuit, while simultaneously catching the eye of fashion photography heavyweights such as Mario Testino. “I had the opportunity. I just never really enjoyed doing fashion,” admits Danny, who used his modeling experience fronting campaigns for the likes of Chanel to fuel his own budding photography aspirations. “The entire time that I was standing in front of the camera I was asking the photographers every possible question that I could that would come to mind. …That’s what kept me interested,” he says. Photography had always been a means of documenting his world travels as a surfer; now, he saw it as a form of art— “like painting with light,” he says. HUMANITY: How does surfing influence photography? DANNY FULLER: I’m a product of my environment, and the ocean has been such a key element in my life. I feel like it’s this vast life force that is a part of who I am, and I am continuously drawn back to it. It’s taken a few years for me to actually understand how my existence as a surfer and an artist kind of go hand in hand, because I’m continuously drawn back to the ocean, which is a very special place for me. I have a very intimate relationship with the ocean. HUMANITY: What compels you to surf? It’s part of who I am. People ask me how I surf big waves for a living. I love getting out of my comfort zone and getting into that place of fear, and pushing beyond that. 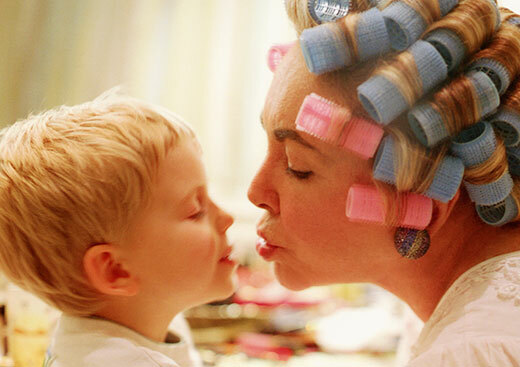 People ask, now that you have kids are you going to continue to do what you do? I don’t know. Any normal human looks at what I do and thinks I’m insane, but it’s part of who I am, and without that I wouldn’t really be myself. Now I physically and mentally prepare myself more for those situations as opposed to just being carefree. HUMANITY: How do you push past that point of fear in the water? Psychologically, there are people who can be faced with a life-threatening situation and the only way to survive is to stay calm. Everything inside is telling you to run but you manage to hold the line and actually put yourself in a position and take that wave. It’s a moment of a split-second decision that I cannot really explain. It’s like a huge adrenaline hit. There are times when you run, but then there are times when you mentally prepare and visualize those situations from in that moment, because that’s what shows that you’re actually in the right headspace to seek the moment. HUMANITY: Is that something you’re born with? DF: I believe so. I realized at a pretty young age that I was kind of a little different than most of my peers. Yeah, there are many other surfers that are absolutely crazy and do much bigger and gnarlier things than me, but it’s something that’s a part of me. I love it. HUMANITY: What’s the most life-defining challenge you’ve faced? DF: My mother fighting cancer. Many of my friends experienced similar cases and were able to kind of shed some light on what I was going through. With something like that you’re just really along for the ride, and you just have to do whatever you possibly can to stay strong and positive and try to get through it. It’s definitely the most difficult thing I’ve ever been through in my life. HUMANITY: Most important lesson you’ve learned from the ocean? DF: In surfing you’re not dealing with something that’s fixed, you’re dealing with Mother Nature and continuously moving elements. So it’s probably one of the only things where I can tell you I am truly present in the moment. HUMANITY: What’s the best piece of advice you’ve ever received, and who gave it to you? DF: Nobody is going to give you anything and you need to go out there and get it for yourself. My dear friend Strider Wasilewski gave it to me. When I was a teenager he was a professional surfer. I’ve used that as an everyday motto in life, because, as a surfer, nobody makes me go out and surf, and I am very fortunate that I do it for a living. No one’s going to go out there and create for me or no one’s going to go to my studio. I need to actually go out there and do the work and apply myself. HUMANITY: Beyond surfing, why is it important to you to raise your family between Los Angeles and Hawaii? DF: Even though I’ve lived in California for so long, Hawaii is ultimately part of who I am, and it’s always nice to be there with my family because I feel like there’s something very special about being brought up in Hawaii. I think you become very grounded and bury yourself in integrity and respect. I like to have that balance, and for my kids to have that exposure of where I’m from, and to develop friendships with people there. It’s a very beautiful quality of life. HUMANITY: What’s your life motto? DF: Take every day one day at a time and try to just succeed to the full potential of every day. Live your life with honesty and integrity and nothing but love for everyone around you. Try your best to be the best you can be in whatever shape or form that is. 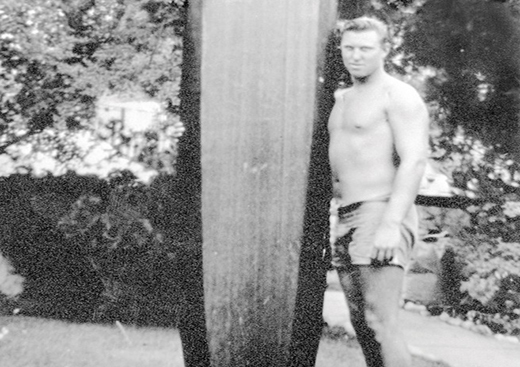 Through her father Walter Hoffman’s story, Dibi Fletcher gives a lesson in surf history.